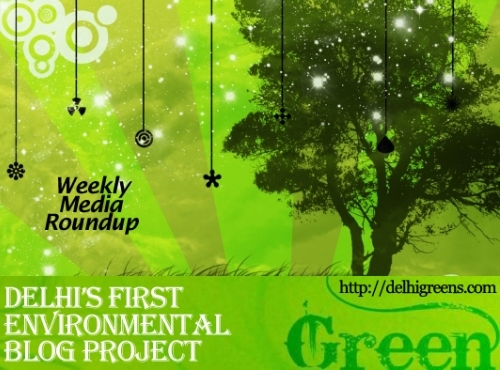 Weekly green news update from across different media networks for week 39 (between September 26 to October 2) 2016. A new report by the World Health Organisation on ambient air pollution levels shows that with very high levels of particulate matter measuring 10 microns or less, Delhi is among the most polluted cities in the world, second only to Riyadh among the big cities. The central government’s recent notification on implementing BS VI emission norms from 2020 may have been welcomed by health and air quality experts, but for now there isn’t much to enthuse about. After a three-month respite, Delhi has again started recording “poor” air quality. Till this week, air quality was hovering between “good” and “moderate”, but experts explained the seasonal transition will herald “poor” conditions, which will possibly worsen over the next couple of months. Following the directions of Raj Niwas, the AAP government has set up a 12-member committee headed by S.K. Gupta, who is from the chemical engineering department of IIT-Delhi, to look into the suggestions and objections received by the city administration’s environment department pertaining to draft notification issued on August 16 for proposing a ban on sharp nylon/ plastic/ synthetic manja and kite flying thread in the national capital. Concerned about the already-stressed Yamuna, environmentalists have written to Lieutenant-Governor Najeeb Jung and Chief Minister Arvind Kejriwal seeking their intervention in protecting the river. Soon, dhalaos are going to be history in south Delhi areas as South Delhi Municipal Corporation today dedicated 5 fixed compactors transfer stations to the national capital. Lackadaisical approach and internal differences between party leaders within the BJP-ruled North Delhi Municipal Corporation is working against Prime Minister Narendra Modi’s “Swachc-hh Bharat Mission”. The seven-member principal committee, headed by Water Resources Secretary Shashi Shekhar, has told the National Green Tribunal that the tentative cost of rejuvenating the Yamuna riverbed — damaged due to a cultural extravaganza organised by the Art of Living foundation — can be calculated only after November as the area is still inundated by floodwaters. As smoke rises from the burning garbage, Bhalswa may as well be on a different planet than the manicured lawns of Lutyens’ Delhi where Union Ministers will mark the second anniversary of the launch of the Swachh Bharat Mission on Sunday. The National Green Tribunal has issued notices to the Ministry of Environment and Forests, Jawaharlal Nehru University, Delhi Development Authority, the Delhi government, and others, seeking a response within two weeks on the alleged illegal construction by JNU in the ecologically-sensitive southern Ridge area. Lata rushes towards the stinking heap of garbage as soon as the dumper pulls away. An IIT graduate has developed a mobile application which will help Delhiites tackle high pollution levels with plants in their houses. Responding to the high court’s direction that there should be no biomass burning this year, Delhi government has decided to file an affidavit explaining that NASA images have proved that pollution levels in the city increase every November due to crop stubble burning in neighbouring states. The Delhi high court on Wednesday refused to stay adherence of the new e-waste management rules in India by a host of manufacturers of compact fluorescent lamp. Sixteen trees native to Aravali and NCR, will soon be notified as “protected” natural heritage, on the lines of recognising special monuments in Delhi. In a move to promote and create awareness, a wide range of sanitation technologies will be up on exhibition at a two-day exhibition in New Delhi from September 29. National Green Tribunal today took Ghaziabad Development Authority to task over indiscriminate dumping of municipal solid waste and garbage on the banks of river Hindon and said the civic body should think about the peoples problems before committing such acts. Delhi, Mumbai and Kolkata top the list of cities that generate huge quantity of demolition waste (debris). Scientists from the National Centre for Biological Sciences, Bengaluru, and the Bombay Natural History Society, Mumbai, recently discovered a new species of the ground-dwelling lizard of the genus Cyrtodactylus, belonging to the subgenus Geckoella, more commonly known as geckos.